Please register for the event through this link and select the appropriate registration type. For any questions, please contact Alex Goodman. To view or modify your registration, please click here. Please register for the event through this link and select "General Attendee" from the registration types to submit a registration request. We will contact you in the event space becomes available. For any questions, please contact ccc@uschamber.com. 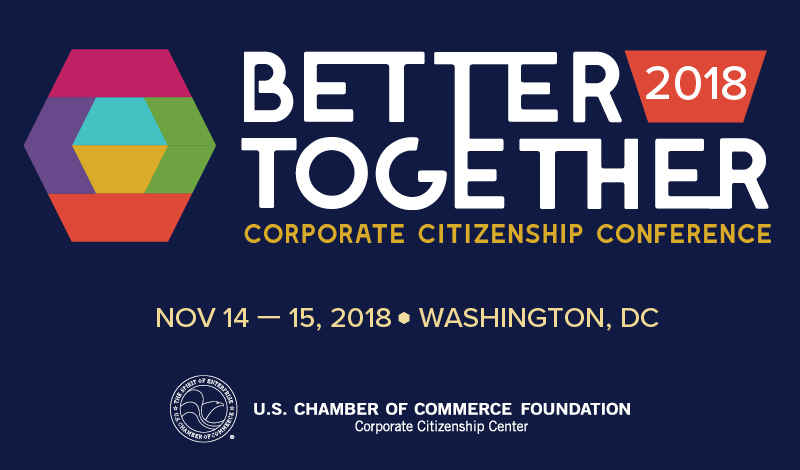 While the Annual Conference is held in conjunction with the Chamber Foundation's Annual Corporate Citizenship Awards Ceremony, there is a separate event location and registration process for each event program. Click the "Register" button at the bottom of this page to continue your Conference registration. You can access the Citizens Awards agenda, registration, as well as previous award winners and rising category finalists here. If you are a 2018 CCC Supporter Company, your organization receives one free registration to the Conference and one free registration to the Citizens Awards. A special discount code will be given to all other colleagues who also wish to attend on behalf of the organization upon inquiry. Please contact Rebecca Mousseau (RMousseau@USChamber.com) or Alex Goodman (AGoodman@USChamber.com) to receive your discount or to verify your supporter status.